Just a few minutes from Hotel Monica we can find the Basilica of San Lorenzo where it is possible to see the wonderful interior designed by Brunelleschi and Michelangelo and which is home to the Medicea Laurenziana Library and the Medici Family Tombs. 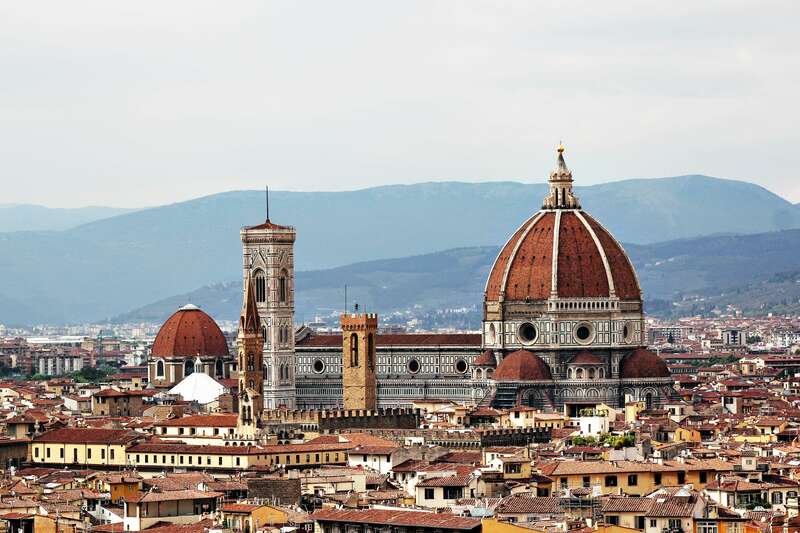 A little further on we come across Piazza Duomo, dominated by Santa Maria del Fiore, the huge Gothic cathedral dating back to 1296 with its huge Dome decorated with frescoes by Vasari and Zuccari. To the right of the cathedral there is the famous square bell tower designed by Giotto. The Baptistery of San Giovanni, one of the oldest monuments in Florence,, is located opposite the Cathedral and is built in Romanesque style. If we carry on down the charming medieval streets, we come to the wonderful Piazza della Signoria, a true open-air museum with Palazzo Vecchio, the Neptune Fountain by Ammannati, the copy of David by Michelangelo and the Loggia della Signoria that houses statues by Cellini del Gianbologna. In addition to the square you will also find Ponte Vecchio, one of Florence's most famous symbols, the bridge lined with antique craftsmen's shops that are still the pride of the Florentine people. After having this surge of art, why not relax in the peace and quiet of the Boboli Gardens, the green lung of the city, created by the Medici Family in 1500.